Nike+ no doubt has first lander advantage in this respect it’s sensible for Adidas to design their gears to be compatible such that customers don’t have to make tough buying decision. Their stride sensors are in fact of similar dimensions. 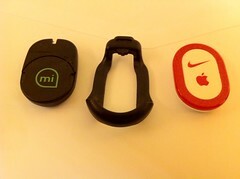 It’s easy to fit the Nike+ sensor into the Adidas miCoach stride sensor shoes lace bracket. 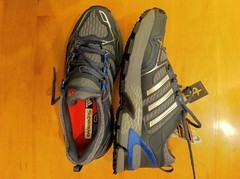 Alternatively you could put the Nike+ stride sensor into the cavity under the Adidas shoe sole. Piece of cake! This is a beautiful route along the west coast of Kowloon. Today I ran with ocean going vessels, ferry to Macao, speed boats of custom and a few men swimming. This is quite different from what I’m used to in Bowen trail since there isn’t much tree big enough to protect me from the sun. Fair amount of ups and downs are also new experience. My friend said traffic is much less on Sunday morning. 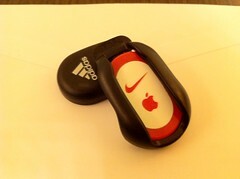 I used miCoach together with the NIke+ GPS iPhone app, too bad signal is again too weak therefore no mapping could be done. I used google map to indicate the route I did above. Distance recorded by miCoach could be very wrong since strike distance has to be adjusted when running uphill. I can see clear sky above me without much tall buildings nearby so it’s disappointing to see the Nike+ app failing. I’ll try RunKeeper app next time. Surely I’ll do this route again on an early Sunday. Again a relaxed morning run, 90% score is my best so far and average HR of 148 must be a new low. However there are two HR spikes in the middle which I don’t understand.